Summer is here and it is awesome! The temperatures are rising, the sun is blazing, everyone is looking for a place to have fun and enjoy the hot weather. The school is taking a much-needed break and everyone is ready to get outside as quickly as possible, find a nice place to bask in the sun, and take a refreshing dip. 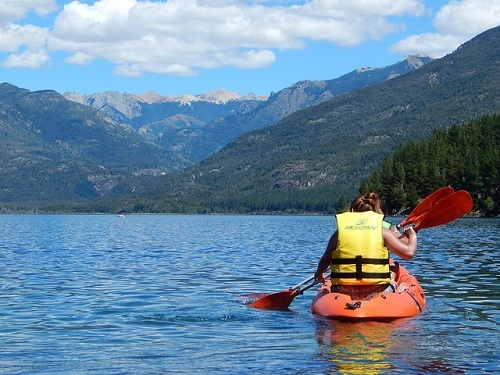 Many will pick beaches as their perfect relaxing spots, but for some of us, who want a bit of a workout during our vacation, a fun-filled kayaking adventure may be the best choice. No matter what floats your boat, whether you want to soothe your senses with a slow-paced paddling across a calm lake, or you want to experience the rush of conquering turbulent rapids, there is something for anyone. Finding the right kayaking spot isn’t hard – there are countless streams, small lakes or marshes across the country that can provide that unique experience that you are looking for. Although not the first area that comes into mind when thinking about whitewater rapids and kayaking, Georgia has one of the best areas for paddling in the country, at least according to enthusiasts. Cumberland island is, in fact, one of the largest barrier islands in the world. And what makes it more special is the fact that it is completely undeveloped and has a pristine, natural landscape which will leave you breathless. The island is the perfect setting for a truly tranquil excursion, kayakers having more than 50 miles of winding canals, ponds and secluded lakes to choose from. The refreshing marshy waterways of the island is also home to a diverse fauna, including wild horses, pelicans, wild turkeys, but also bobcats, armadillos and sea turtles. The only downside to kayaking on Cumberland Island is the fact that the National Park Service only allows 300 people on the island at one time, but this is what makes it so special, after all. Just keep in mind to make a reservation before heading out. If you are looking for the ultimate whitewater experience, the upper segment of the Iowa River is your best choice. Though most of Iowa is as flat as a pancake, surprisingly there are great rapids in the northern parts of the Iowa river. There’s everything you could want from a whitewater adventure: 330 ft towering cliffs, turbulent rapids, and an awesome unspoiled wildlife. Starting from Lime Springs and ending near New Albin, the river takes you through the most picturesque areas in Iowa. What’s more, the stretch between Kendallville and Decorah is filled with canyons, breathtaking cliffs and fantastic chimney rocks that loom over the valley. Kayaking on the Upper Iowa River is great for both experienced kayakers (particularly the Kendallville-Decorah stretch), but it is also a great place for beginners, especially on the final stretch of the river, near New Albin. When it comes to kayaking, the Ozarks are something special. They combine rugged cliffs, caves and deep valleys with calm waters, quiet lakes and, what everyone is looking for – hundreds of miles of crystal clear, pristine streams and rivers. The Ozarks are literally a dream come true for kayakers: you can go on a lazy paddle across a quiet lake and bring a waterproof dry bag with a camera and lunch to enjoy, while taking in all the breathtaking scenery. Though, if you are a thrill seeker, you’re in for quite the ride as you conquer the turbulent rapids just a few miles away. For instance, the Buffalo River takes you through more than 150 miles of rugged Ozarks country. It ranges from wild whitewater rapids to deep pools of calm water in the lower areas. You can also go for a swim in any of the swimming holes which litter the area near the river. Flaviu Mircea is a freelance writer and traveler who enjoys seeking out new destinations to explore. If you're interested in learning more, check out Flaviu's Google+ profile. This entry was posted in Arkansas, Georgia, Iowa, United States, Water Sports, White Water and tagged Kayaking. Bookmark the permalink.